With the beginning of the 21st century, a new page was turned in The Divine Comedy’s story. After ten years with Setanta Records, the band has changed for a major, Parlophone Records. This change implied a change in music and style too. The orchestral pop time was over and has been sealed by the release of a best of, A Secret History... The band has grown mature: some of its members were now married (Neil Hannon to Òrla Little, and Joby Talbot to Claire Burbridge). And they want to achieve something different. Regeneration is the proof of this new ambition. With a producer no other than Nigel Godrich, who has been working with Travis and Radiohead, whose influence is highly felt on the album, to the extent that the album has been controversial. However, the aim of such a production, and the sound of it were definitely Neil Hannon’s decision. Soon after the release of Fin de Siècle, he already stated that his next album would be less ambitious . The song ‘Too Young To Die’ written at that time was also a sign of the change in the look: instead of hiding behind a suit, Neil Hannon shows himself as he really is, wearing jeans and trainers, and with long hair as in 1989. The songs were said to be written when Neil and his wife moved house in London, therefore he did not have access to his home studio and mainly composed the songs on guitar in his back garden . These new songs were then premièred live in Scotland in February 2000 when the band was waiting for Nigel Godrich (they joked about it by suggesting calling the album Waiting For Godrich as a reference to Waiting for Godot ). Mainly, the songs were very similar to their final version and so Nigel Godrich was actually not to blame for such a radical musical move. Although Nigel Godrich had big role in the production, as he provided a lot of new working methods to the band , and helped Neil to keep on a back-to-basics approach, and not let him following any idea of his own on the production, as on the previous records. So, original idea such as ‘Perfect Lovesong’ finishing as a Beach Boys pastiche , or ‘Mastermind’ being a country song, were evicted for a more conventional production. Neil described the experience later as trying being a professional musician . The album was well-received by the press who then even rejected the previous album Fin de Siècle as too ambitious. Neil’s songwriting being still strong, with lyrics full of references but still accessible, it makes a solid album. It was also well received in Europe (in France the album sold more copies than any previous DC album). The album targeted a new audience for the band, a more ‘indie-rock’ audience who never heard about DC before, or even disliked the band because of the previous album’s orchestrations. On the other hand, it wasn’t so well received by the past DC fans, and even seen as a disaster. Then most of the fan communities exploded, and the audience was definitely renewed. 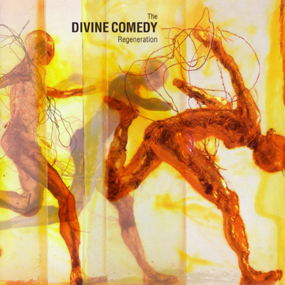 Regeneration was a difficult album in the career of The Divine Comedy. Opinions on the album can be very different from a listener to another, and we won’t give one. But the songs remains Neil’s songs with his songwriting, and letting them fitting a different style was to be the main quality of the opus.